To register, you must fill out and sign this Registration Form. NOTE: The form is interactive and can be filled out electronically using Adobe Acrobat Reader. If this form does not work in your Internet browser, save the form on your computer and then open it. Then, send the registration form plus a $200 deposit and include a post-dated cheque for the balance dated May 1st. If you cannot include a post-dated payment (e.g. if you are paying by Interac or PayPal), the payment must be made in full. See payment and options below. No booking is complete until the registration form, deposit, signed waiver and post-dated payment are received by the Registrar. Once booking is confirmed, a confirmation letter, with detailed trip information, will be sent to you. Registrations are open to everyone, however, at least 67% of bookings per camp are reserved for returning hikers until February 1. Afterwards, registrations are available on a first-come, first-served basis. Skyline Hikers can accept payment denominated in Canadian dollars. 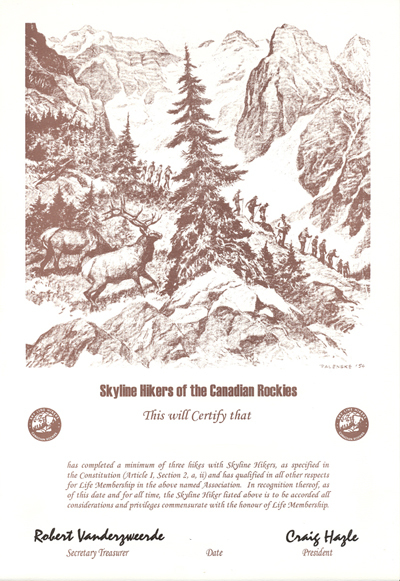 All payments should be made out to "Skyline Hikers of the Canadian Rockies" or "Skyline Hikers" or "SHCR". If you wish to use PayPal, add a 3% service charge to the total on your registration form and click on the link below to pay. Payment must be made in Canadian Funds (CAD). Payments are subject to cancellation fees (see the registration form for details). Any monies paid cannot be carried forward to future years. You may want to consider the purchase of appropriate insurance to cover against your cancellation of participation. Some vendors of trip cancellation insurance include auto clubs (e.g., CAA and affiliates), insurance companies and financial institutions (e.g. Co-operators, RBC Insurance), and travel agencies. There are also online sources for trip interruption insurance – such as Kanetix.ca, TravelInsuranceQuotes.ca, Expedia.ca, Travel-Insurance-Worldwide.ca, or InsuranceHotline.com. 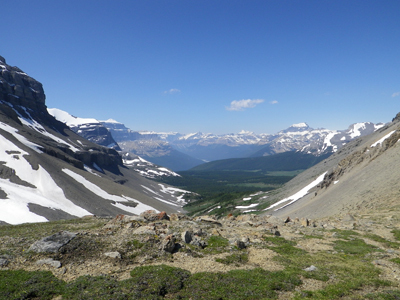 Registration for camp includes membership in the Skyline Hikers of the Canadian Rockies, which is valid through to June 30th of the following year. Those who have attended previous annual camps and are not participating in this year's camp are invited to maintain their status as a member in good standing through membership renewal. The annual membership fee is $20.00 per person ($30.00 per family). Please use this membership form to renew your membership. Receive advance notice of registration for annual camp and hike program. Receive information bulletins and circulars, including annual newsletter. Help sustain Skyline Hikers as a not-for-profit organization. Lifetime members receive a membership certificate and no longer have to pay the annual membership fee. Lifetime membership is automatically granted if you've attended ten (10) or more camps. Lifetime membership can also be purchased for $200.00 but you must have attended at least three (3) camps.